This week, I asked my students to write about summer and gave them a selection of writing prompts. As I reflect on the lesson I remembered various summer activities and memories from childhood. Croydon, eighteen miles from Melbourne GPO and even further from the nearest beach, was considered ‘the sticks’ and for those living in the outer suburbs, summers were long and hot. A public swimming pool, therefore, considered a tremendous community asset for hundreds of children to spend hundreds of hours creating carefree memories. The egalitarian pool open to everyone regardless of income or generation. Days spent there helped us enjoy adjusting to our new country and to cope with the culture shock of a sweltering Christmas, instead of sleet and snow. Working class people rarely went on vacation, so the Croydon pool a wonderful alternative to driving the hour or two to the closest coastal beaches of Seaford and Edithvale. No freeways then. That first summer, we attended the pool almost daily establishing a pattern of regular visits that continued for several years. Each day seemed like a holiday, especially with the crowd that our family and friends made. Fortunately, the entry cost minimal – there may even have been a discount for family groups, I can’t remember. I know we shared a locker, which caused ructions at times if people wanted to go home early and the keeper of the key resented getting out of the water! This sign should probably have been put at the entrance of the pool! Ignorant of skin cancer people lay smeared with coconut or baby oil, sunbaking on the grass or lying on the concrete surrounds. There were few trees in the early days with those planted still to mature. I recall many sleepless nights with painful burning skin despite mum’s home remedies of vinegar or cold tea compresses. No sunscreen then either. A few exhausting hours playing at the pool made a walk home in the heat unattractive. We planned visits to coincide with Dad’s shifts or so someone else’s parents could pick us up. With no seat belt rules and few cars on the road, it was amazing how many kids could be crushed into Austin A30s, Morris Minors, Ford Consuls, FJ Holdens or Dad’s Vanguard Utility. We still arrived home hot and sweaty with the cooling benefits of the pool undone, but not as tired if we’d walked! Mum and Dad were sticklers for ‘no swimming for an hour after you’ve eaten.’ My father’s older brother, John drowned in Corpus Christi in 1927, while serving at sea as an engineer. It was thought he took cramps because he went swimming too soon after a meal. In addition, my father lived with a personal memory of a traumatic incident from his childhood when he nearly drowned. Therefore, our time at the pool regulated and rules enforced without compromise. Negotiated longer periods for swimming meant going mid-morning and leaving mid-afternoon. We may miss out catching up with chums and went hungry until we returned home; the only sustenance being a frozen Sunny Boy, or Choc Wedge, bought with locker refund money. Our melting frozen treats held between soft wrinkled fingers, made us fly magnets. We’d sit on the kerb outside the pool waiting to be picked up, competing to see who could kill the most flies with our thongs. Mao Zedong would have been proud of us. Under his ‘four harms’ strategy 1958-62 he urged citizens to kill flies, mosquitoes, rats and sparrows, the four pests that damaged crops. The great campaign almost eliminated the common housefly as the Chinese swatted with zest. Days at the pool hold magical memories: meeting friends at weekends or holidays, mixing with kids from different schools, swimming, diving, playing games and showing off our healthy physiques. Not everyone had the telephone connected, not everyone had a family car, opportunities for meeting and talking outside school hours were few. Many romances started – and ended – at the pool. The era of the ‘itsy bitsy teeny weeny’ bikini upon us, although bathers in the 1960s didn’t reveal the flesh of later fashions. However, Speedos were at the height of their popularity and once wet never left much to the imagination. Of course, ex-PM, Tony Abbott has made ‘budgie smugglers’ famous! I made my one and only dive from a diving board at Croydon Pool—the small diving board, of course. I lacked the courage to do anything but jump off the big diving board and I only did that once. Through adult eyes, how small those boards look, yet the climb to the top of the ladder and the panic of spluttering chlorinated spume after hitting the water and scrabbling to return to the surface, still haunts me. As does the sting of bellyflops. 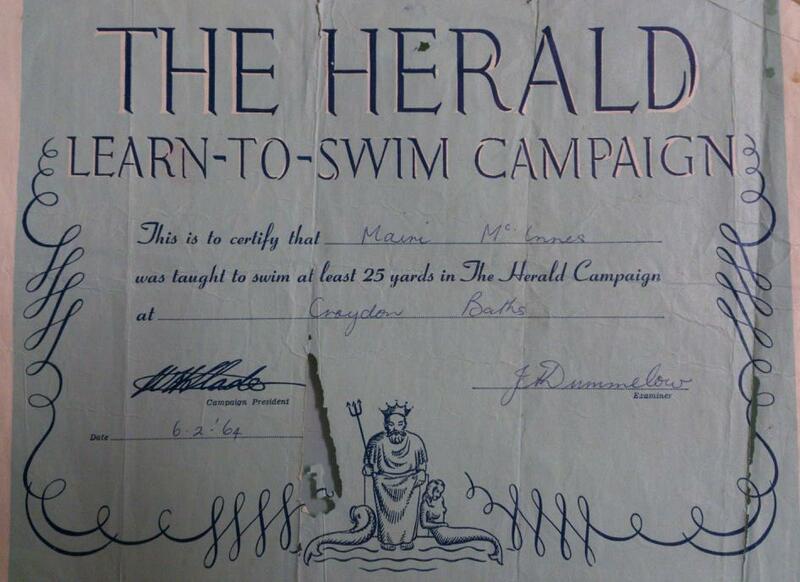 I passed the Herald Learn To Swim Certificate by swimming the 25 yards across the Croydon Pool and even managed to get my Junior Certificate after doing a rather pathetic dive in old clothes from the pool’s edge. Never good enough to be in the school swimming sports, I do remember sitting on the concrete steps cheering my brothers until hoarse. At one stage there were five McInnes’s at Croydon High School and we were all in Surrey House so I would have been waving yellow streamers. The houses at school named after English counties: Surrey (yellow), Ashburton (red), Guildford (green) and Kent (blue), a veritable chanting rainbow around the pool. Not a water baby, I preferred the gentle introduction of a dip in the toddler’s pool where the water warmed quickly on a hot day compared to being pushed into the freezing water of the big pool or splashed unmercifully if you tried to ease gradually down the steps at the side. On some days, Croydon Pool so crowded, that the only safe way to enter the water was sliding into the pool from the edges. Many times an accidental knock left me gasping because I landed in the pool before I was psychologically prepared for the water temperature. The shallow end of the pool the spot for one of our favourite games – diving for pennies. If we were broke someone would unpin their locker key from their togs and we’d dive for that. We never seemed to tire of playing tag or challenging each other to underwater tricks or races across the pool. The sensation and taste of chlorinated water bubbling up my nostrils still vivid as we dared to venture into deeper water. I can recall the ache in lungs as I struggled to complete laps rather than be stranded treading water somewhere in the pool out of my depth. The sandpaper roughness of the sides of the pool and the pain of scraped skin another not so pleasant memory. Everyone skylarked, even though attendants seemed to really have eyes in the back of their heads and order ‘naughty’ children to take ‘time out’ or ‘be warned’. When bikinis became fashionable there was more than one embarrassing moment as girls were ‘dacked’, or had their tops untied. Those dolphins who could swim underwater for an amazing length of time played pranks that sent excited squeals and gales of laughter reverberating across the pool, especially if they forced their way through your legs when least expected to tip you over – and under. Several generations learnt to swim, socialise and have fun at the Croydon Pool. Now more than fifty years from my childhood and many homes have backyard pools, multiple family cars, and the time and money to travel to beaches or resorts. Croydon is no longer considered ‘the sticks,’ but has been absorbed into Melbourne’s urban sprawl. However, I hope others value their memories of days spent at Croydon Pool and ensure it’s always a community asset. Today, schoolchildren, pensioner aerobic classes, toddlers having their first taste of water outside the bathtub, and anyone else cooling off or exercising must be happy the pool is there. < Previous I Remember Mum Saying – You’ll Eat Worse Than That before You Die! Next > Limericks, Laughter and Lessons – Form Poetry is Fun! Thank you for reading Glenice!